Hundreds of people have attended the funeral mass in Belfast of Ruth Maguire, who died on a night out with friends last week. 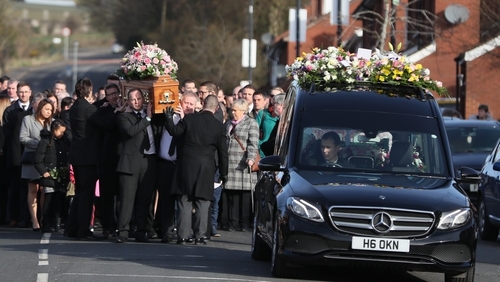 Ms Maguire's coffin, covered in flowers, was followed by her partner Jim and three children - Tyler, Lydia and Oliver - who were joined by hundreds of tearful mourners on their way into mass held in St Vincent de Paul Church in Ligoniel, north Belfast this morning. A number of bouquets of flowers were carried by members of the RNLI, while a bouquet that spelt out "Friend" was driven in the hearse. A guard of honour made up of children and adults from Ms Maguire's local GAA club, Bryansford GAC in Newcastle, where she volunteered as a coach, stood outside the church. During the service, mourners heard how Ms Maguire, who was originally from Belfast, worked in Daisy Hill hospital in Newry, and although the baby of the family, was "the boss" who looked out for her sisters and brothers. "May she meet you Jim in God's kingdom, dressed in dazzling white," the priest added. Speaking to her three children, the priest said: "Don't you ever think that because you're wee your prayers aren't powerful. God listens to your prayers so carefully, you remember that. A card made by her young son for Mother's Day next week has taken pride of place in their home with the many sympathy cards sent by the local community.